HomeHuntingLost your tree stand? There’s an app for that! 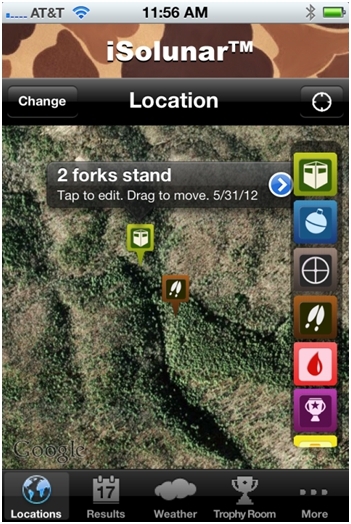 One might expect the last thing a stickbow hunter would embrace in the field would be a smart phone and a bunch of techie apps. In most cases, that would be a safe assumption but, as my wife would be happy to tell you, I am a walking contradiction. While I traded my compound for a simple stick and string years ago, I still embrace technology in several other forms, one of them being my smart phone. My phone usage goes well beyond communication and text messaging. In fact, during the past couple deer seasons, I have begun to utilize apps on my iPhone for everything from planning the best vacation days, to finding my way back to prime locations that identified during winter and spring scouting sessions. I have tried a multitude of apps. Some were decent, others were downright useless, but every now and then I stumble across one that not only works well, but becomes part of my outdoor routine. Now before anyone gets the wrong idea, I am not sitting in my stand or blind tinkering with my phone like an eight-year-old with a Nintendo DS. The apps I use most are really more beneficial before or after the hunt. The phone stays in my pack while on stand. One other point I should mention is I am cheap! I will go out of my way to find an app that is free or at costs under $1 at most. However, I find that the cheaper apps, or in some cases the free versions of an just do not provide the features that a higher priced or full version provide. Even here the old adage “You get what you pay for” rings true. With that said, there are still some really good, hunting related, free apps out there, and I will be sure to cover those for you as well. When compiling the list of apps I wanted to share in this article, I tried to focus on those that provide a specific value to hunters. There are many apps that attempt a lot of different things in one package. I find they generally do not do any one thing well enough to warrant their use. There are exceptions but these are few and far between. Several years ago I read Charles Alsheimer’s, “Hunting Whitetails by the Moon” and subsequently began researching game activity and moon phases. Later I even began planning hunting trips and vacations based on the lunar phases, but I admit I was never “in tune” to the point that I could memorize when a full moon or new moon would fall. I always had to look to an almanac or other means to make plans.. Then, last season I ran across the iSolunar app, and figured I would give it a try. 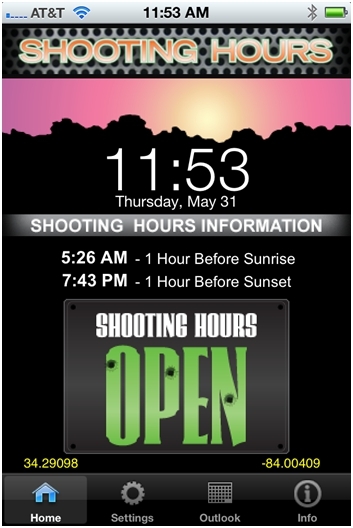 It quickly became one of my go to apps for outdoor activities. 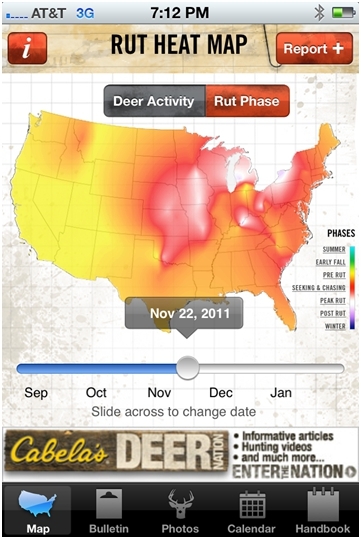 Now, from my phone, I can look for expected periods of high animal activity next week, next month, or even for opening day of the 2012 Archery season for any area that I hunt. Results for anticipated activity are rated on a scale of 1-4 and the app lets you set a theme that displays results as 1 of 8 different species of fish, wild turkeys or deer antlers. 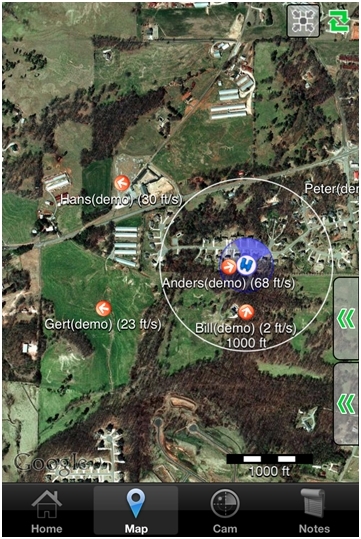 In addition to expected animal activity, the app allows you to map to your location using the built in GPS and Google maps and place markers on your specific location to save information such as stand or blind locations, feeders, game trails, fishing spots, and more. I am sure I’m not the only individual that has found a stand and climbing sticks still attached to a tree five years after I placed the stand because I forgot about it. Now I can keep track of them all with one app and so can you. While somewhat limited, there is also weather information available and the ability to save information about your catch or harvest within the app. Another nice feature added recently is the ability to send an email from your phone with Solunar information about any location, and any available date either for future reference, or to help out a buddy. 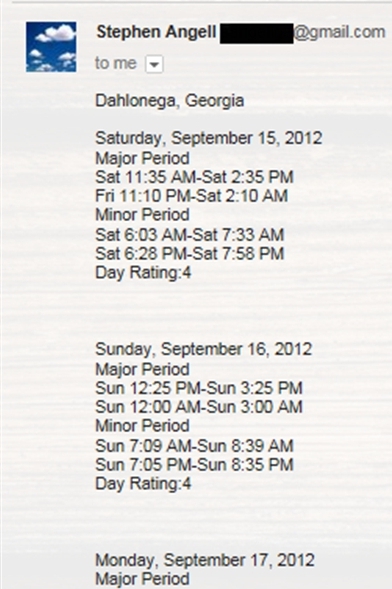 The email below was sent from my phone to one of my email addresses with information about the second weekend of the Georgia archery season in 2012. Anyone spending enough time in the outdoors will eventually get lost (or at least turned around). It has happened to me before, and I speak from experience when I say the mind can really play tricks on you when this happens. Perhaps even more dangerous is the panic that sets in causing one to not think clearly. I have found that having something to focus on helps tremendously and allows me to focus on the challenge at hand. While I can’t take a paper copy of a survival guide with me everywhere I go, having the information at my fingertips via my phone might come in real handy should an emergency arise while afield. 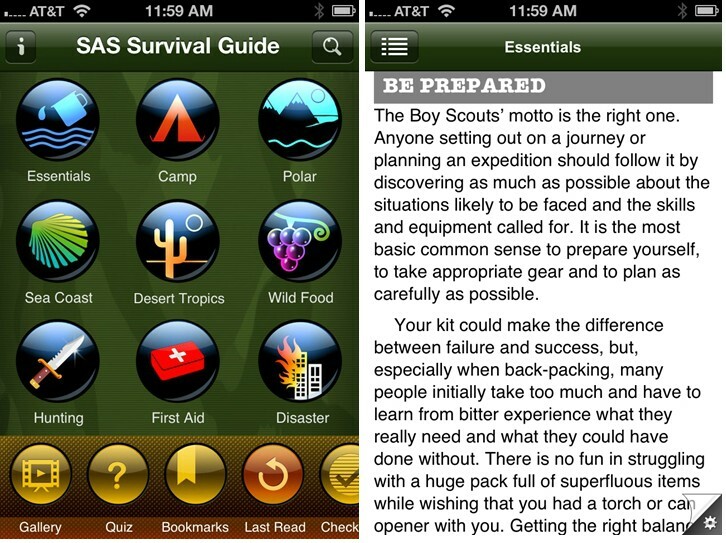 The SAS Survival Guide app provides volumes of valuable information at your disposal without requiring cell service. This means that the information is available when it matters most, when you are in very remote areas where you might not have any means of reaching out for assistance. The information provided is useful for any number of emergency situations, and gives you something to focus on to prevent panic. In addition there are sections for First Aid, and specific survival instructions that may not be native in your immediate location, but might be helpful if you are away from your geographic “comfort zone”. Lastly, there is an included quiz that you can take to test your preparedness, and identify weak areas you may want to research to be better prepared. It is definitely worth the $6. Just for good measure I am going to throw in a couple of free apps I have found that have exceeded my expectations. This could be used by Archers of all styles, but there are specific statistics that are really important to us stickbow hunters. Brace Height being one that is particularly tricky because it is specific to a particular bow and sometimes to a specific bow, string, and arrow combination. 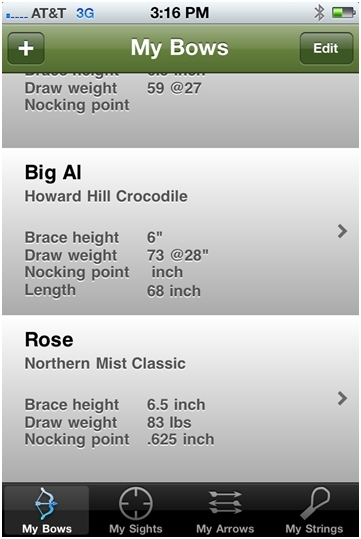 The app provides a means of creating a quick reference for your bows, sights, strings, and even arrows so these measurements can be readily available quickly if the need arises. I store as much information as I can about my equipment in this app and then use my phone to save an image of each, so I always have a back up on my PC. 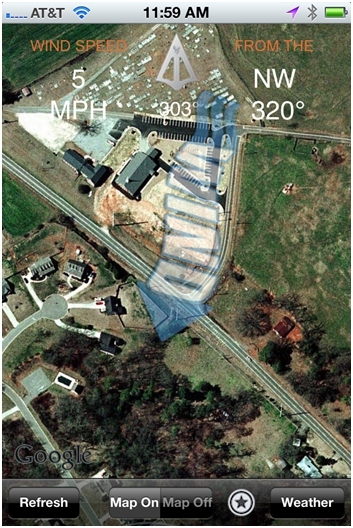 Below is one such image. Very simple yet very handy! In conclusion, I am sure many of you have seen some of these before, but I am hopeful this information will prove useful to some of you. The bottom line is I like to take a break from technology myself from time-to-time, but also know when technology can assist a hunt or make my outings safer. I would love to be one of those guys that make a living spending time in the great outdoors. So far I have not been so lucky, and like most of you, have to make a living doing something else. 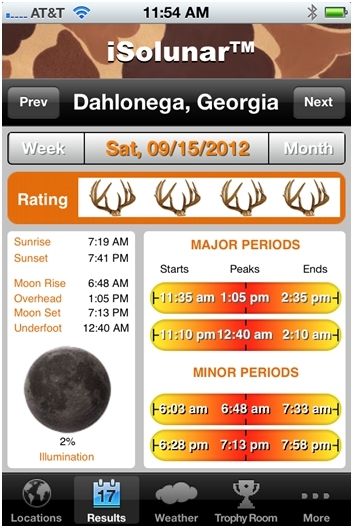 If an app on my phone can help make the most of my time in the woods, then I am smart enough to embrace that technology. Now if I can just remember to set the phone on silent when I leave my truck! May all your arrows find their mark! This article previously appeared in the Summer edition of Stick and String Magazine.